My favorite time of the year is the Christmas season. There is so much promise, joy and good tidings rooted in the meaning of Christmas. But if I’m really honest, I would confess that the meaning of Christmas is easy to lose in all the hustle and bustle. One area in particular that I struggle with is gifts. Gifts can be a cool way to show love to the important people in our lives. Gifts are also a very real and physical reflection of the true meaning behind Christmas: Jesus’s birth. After all, the nativity story is the ultimate story of gift giving, isn’t it? God gifted the world His only son who was born to Mary and Joseph as a tiny babe.Jesus lived, died and rose again to restore our relationship with God. That’s a pretty powerful gift! My struggle isn’t in the gifts themselves. It’s in making them meaningful. One way we give meaning to gifts in our family is by getting the kiddos involved. We don’t spend a ton of money on anything fancy. But, we do like to give heartfelt things that encourage 1) spending time making something together or 2) gifting things or opportunities to spend meaningful time with our loved ones. Today, I’m sharing a fun craft that meets both of those requirements. 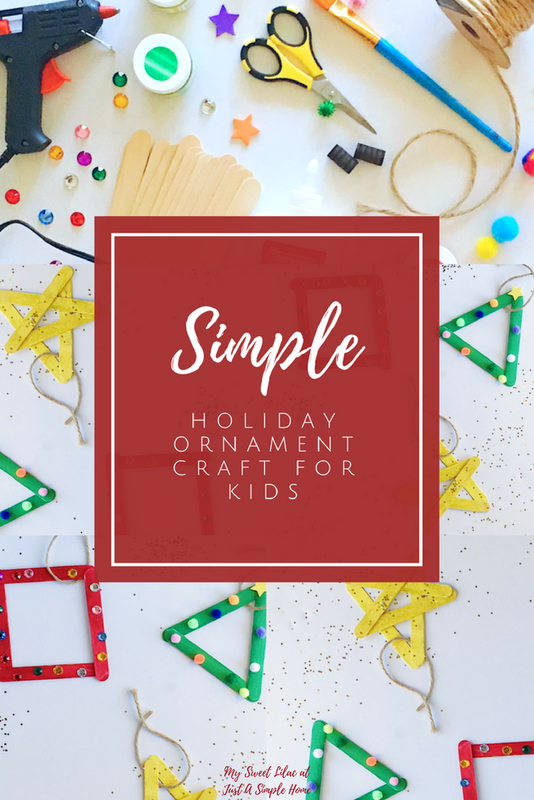 It’s a pretty classic Christmas ornament craft that gifts us mamas quality time with our kiddos while making something heartfelt for our loved ones. But don’t worry: this isn’t a huge time sucker. I love finding ways to simplify kiddo crafting. So, I’m mixing this classic craft up a bit by including “less fuss” and “least fuss” options to make this craft simpler, less messy and less involved. Step One: Paint the popsicle sticks. *Less Fuss: Dye plain popsicle sticks with food coloring (just like you would dye easter eggs). *Least Fuss: Buy pre-dyed popsicle sticks or colored foam craft sticks. Step Two: Use the hot glue gun to glue popsicle sticks into shapes. We made trees, stars and presents. Step Three: Decorate! Let kiddos dip their decorations in craft glue and stick onto their shapes. *Less Fuss: Use foam stickers or regular stickers to decorate the shapes. *Least Fuss: Use markers or crayons to decorate the shapes. Step Four: Tie ribbon or twine around ornament. Step Five (Optional): Print out a photo and glue it to the back of the ornament so the front of the photo is facing out. *Less Fuss: Have kiddos make a drawing or write a poem instead of a photo. *Least Fuss: Skip this step! Step Six (Optional): Hot glue magnets to the back of the ornament. Now your ornament can hang on a tree or fridge. This ornament craft is a great gift for grandparents, aunts, uncles and close friends. They will love and cherish it for years to come! We like to make a few of each shape plus an extra one or two for our own tree! This craft has become a fun yearly tradition for our family. I hope your family enjoys it, too! Looking for another simple Christmas activity for kids? Submit your e-mail to receive a fun Roll-the-Snowman Game printable. Then, hop over to My Sweet Lilac and search “snowman” to read how this game makes a great neighbor gift! This little game is such a treat to play with big and little kids alike! Wishing you a blessed holiday season.